We maintain a unique and diverse selection of mostly American upright and grand pianos, with special attention given to prewar New York City produced Steinway pianos. We also have an affinity for many other classic American makes--pianos made with pride and built to last. Mason & Hamlin, Knabe, Chickering, Baldwin, Hardman, and Sohmer are just a few examples of American makes that featured quality craftsmanship. We also believe in Japanese companies Yamaha and Kawai, and occasionally a rare German or English made piano will find its way into our showroom, helping diversify our unique selection. We strive to pay attention to every detail, from playability and sound to style and finish, which makes each piano a fine centerpiece in every home and apartment, that, of course, sounds and plays in fabulous manner! Below is a small sampling of the pianos that have graced our showroom over the last several years. This is one of the finest pianos that we've come across, a 1889-1890, fully rebuilt Steinway short-scale model A (6 feet even) refinished in a subtly elegant satin black. With a new Italian Ciresa spruce soundboard, pin block, action (all Steinway parts) and damper back action, this is nearly as new as an older piano can get. The original ivory naturals and ebony sharps are in great shape. A throwback to a time when pianos had 85 keys (or less), this makes this piano quite unique, while also saving you thousands of dollars when compared to an 88 note piano. 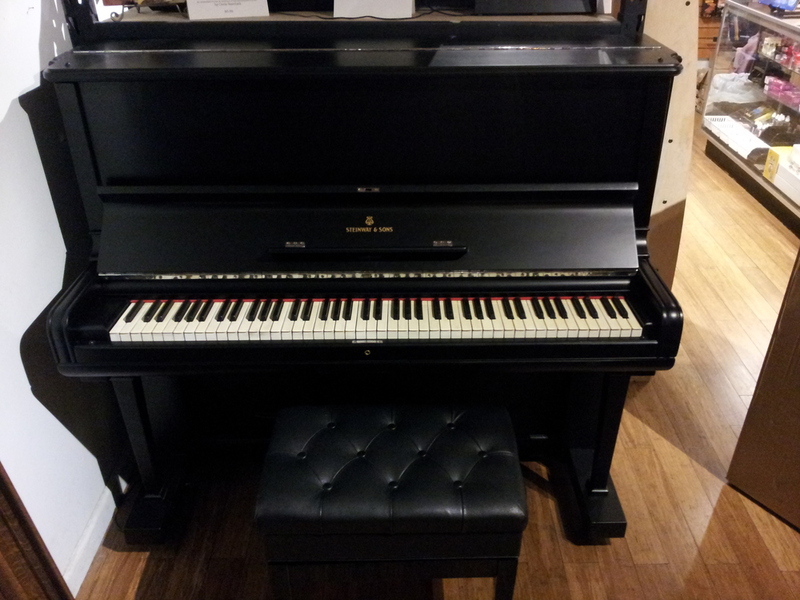 Take advantage of this, this piano is one to be seen, played and heard! 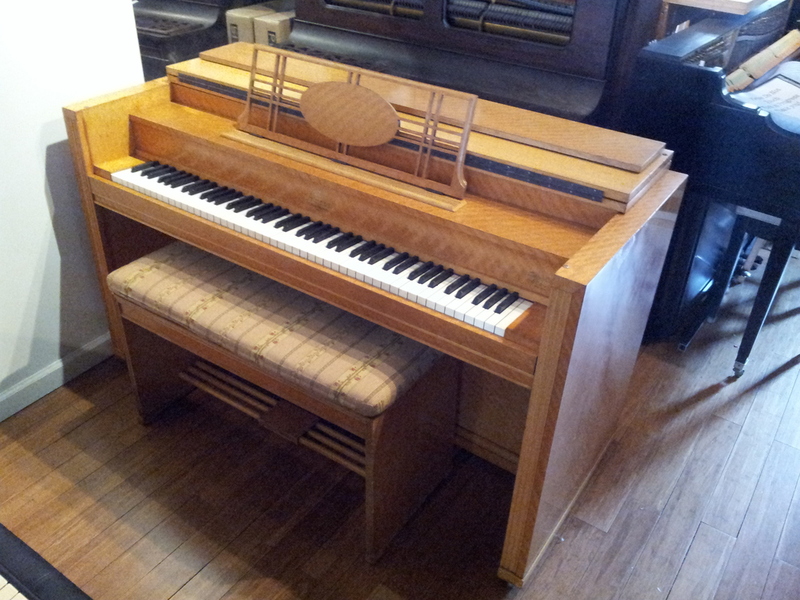 An amazing new arrival to the shop and easily one of the most breathtaking pieces we've ever had in our space, this piano features a completely rebuilt player unit that can play piano rolls cleanly and accurately. Currently it is as it's original condition in that purely mechanical as pumping of the foot pedals provides suction which powers the system. An electric vacuum motor can be added for automatic playing, giving the choice of electric or mechanical. Or course, this unit functions as an acoustic piano as well! Please come to the showroom to hear this amazing artifact that punctuates the unique slice of Americana in the early 20th century. Guaranteed to make you smile! Refinished and mostly rebuilt small Steinway console. Reddish-brown mahogany with matching bench. New hammers, hammer butts, shanks and damper with refurbished repetitions. A great starter Steinway! Stunning custom satin black case with wood grain accent. With muting rail and three year warranty. Near mint condition case and action. Satin walnut finish. 1967, extremely very well cared for and hardly played. Solid wood panels. 3 year warranty. Rebuilt out of the Smith Street shop a few years ago, this fabulous Steinway is in a nearby photography studio, safely covered but ready for the playing! 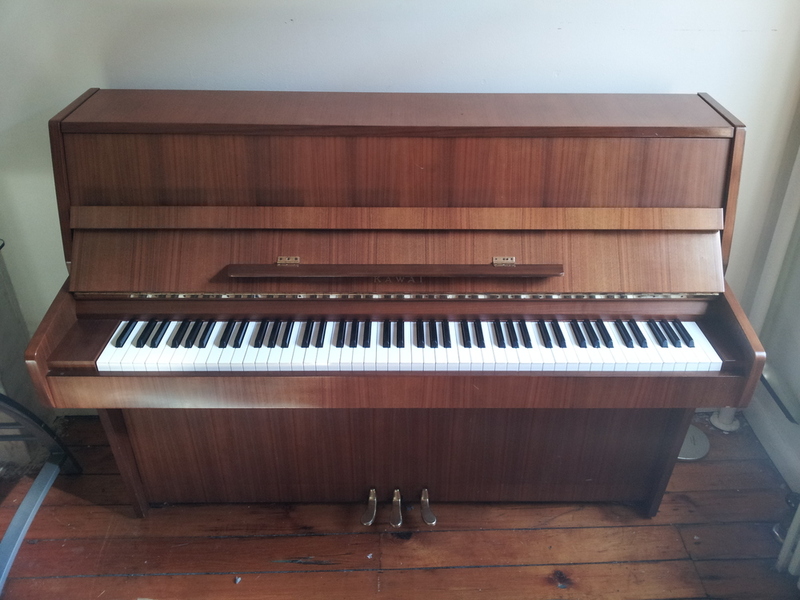 It still has its original ivory keys in fantastic shape, this has been rebuilt with a complete new action. 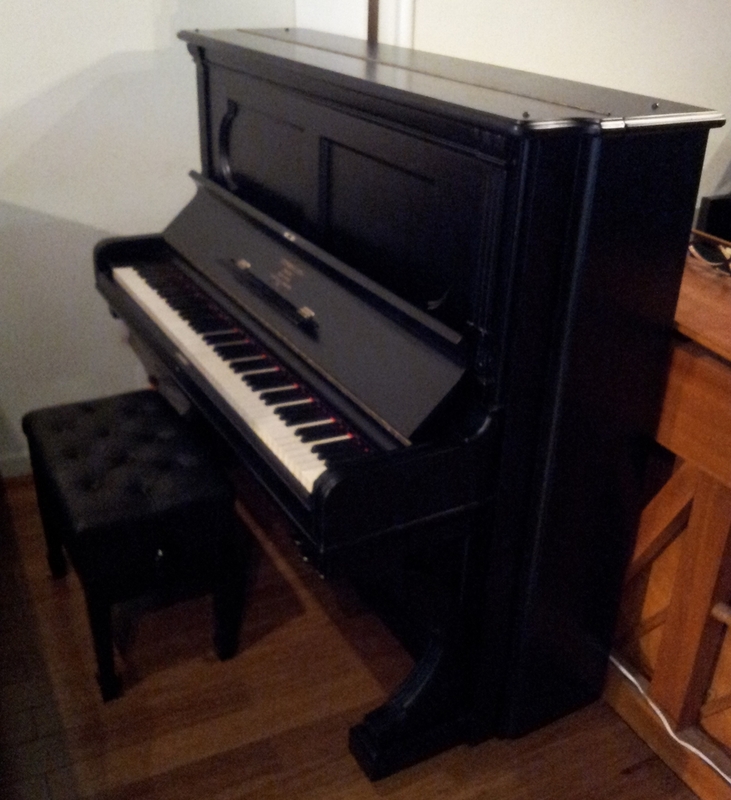 The original soundboard has been repaired and sealed, and the piano has been refinished in a beautiful satin black. It looks, plays and sounds like a dream piano! This is a fully rebuilt vintage model A dating to 1907. This fine piano is upgraded with a complete state-of-the art new action with Wessel Nickel & Gross composite parts and the highest quality Ronsen Weickert felt hand-made hammers. The soundboard is a new Italian Ciresa forested (and sustainably produced) spruce with both bridges recapped. The bass strings are hand wound by highly respected string makers JD Grandt. Almost every part of this piano has been upgraded from industry standard materials. The finish is a sleek satin black. This piano is $10,000.00 less than anything comparable on the market, mainly because the top has a few fine scratches and the key-tops are plastic, one of the only aspects that we didn't work on in the shop. In-piano humidifier/dehumidifier (Dampp-Chaser system), warranty, local delivery and tuning included. One of the most beautiful Steinways that we've seen, this figured (technically referred to as "mottled") mahogany-cased grand piano dates to 1926, and still features the original soundboard, re-sealed and restrung with a new pin block and complete new action. The rustic nature of the wood is brought out with an oil finish in a satin sheen. The original ivory keys are in excellent condition, and the Steinway hammers are voiced for a sweet round tone, not too brash but with plenty of power. In addition to the in-piano humidifier/dehumidifier (Dampp-Chaser system), a three year warranty, local delivery and tuning is also included. SOLD. This is a fabulous deal on a fabulous piano. Pre-war Steinway grands are among the finest pianos ever made and highly sought after. This dates to 1912 and the original soundboard is still in amazing condition--not even a hint of a single crack! The piano's action has been rebuilt with Hamburg Steinway hammers. The original ivory keys and ebony sharps compliment the mahogany case, which has been polished for a refined antique finish. 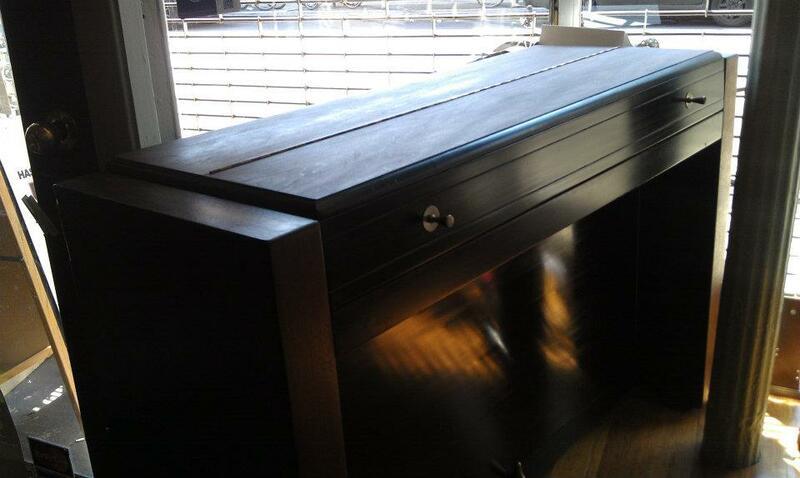 This piano could be fully refinished in any desired sheen to look completely new. The action is light and responsive, with a slightly mellow attack but plenty of power in forte playing. 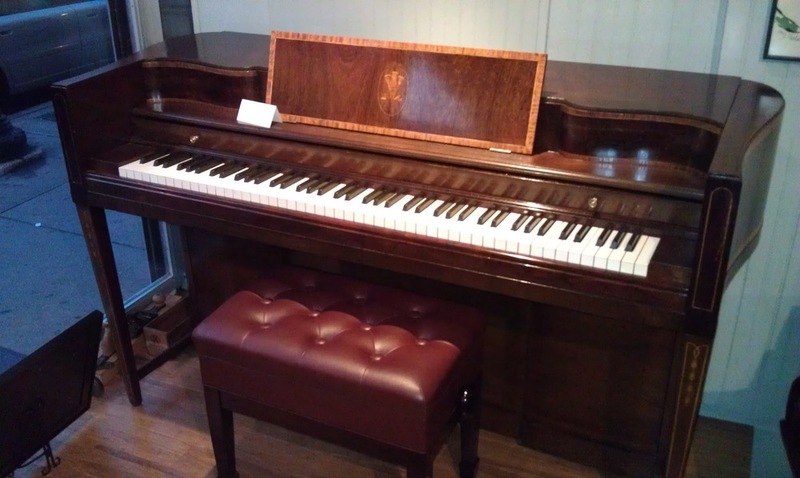 This is a great piano for those ready to make the initial Steinway grand investment, but not quite ready to invest the $30,000 or more that most pre-war Steinway grands go for these days. Includes an in-piano humidifier/dehumidifier system (Dampp-Chaser), local NYC home delivery, tuning and a three year warranty. Manufactured in Cincinnati, OH in 1963, this piano has been well cared for its whole life. The reshaped hammers remain resilient and the touch is light and crisp. The semi-gloss black lacquer finish is very elegant. At 5'8" in length, this piano is a perfect size, not too big for a New York apartment, but also big enough for a clear bass and big sound. This lovely little 1967 Chickering grand piano is only 5 feet long! Elegant Queen Anne legs and music desk adorn the walnut case. A perfect starter grand piano, action regulated and voiced. Local delivery and tuning with a 3 year warranty. Manufactured in Germany, 1909! A rare and beautiful piano, refinished in an elegant gloss black, complete with ivory keys, a side-mount mute rail switch, and engraved pedals. The original hammers have been replaced with a mellow and soulful set of Ronsens, made by hand in Boiceville, New York. Sale includes delivery, tuning and two year warranty. Manufactured in East Rochester, New York, 1952. Mahogany with flawless ivory keys and genuine ebony sharps. Refurbished action with re-bushed keys. Matching bench included. Local delivery, in-home tuning and 2 year warranty included with sale. SOLD! 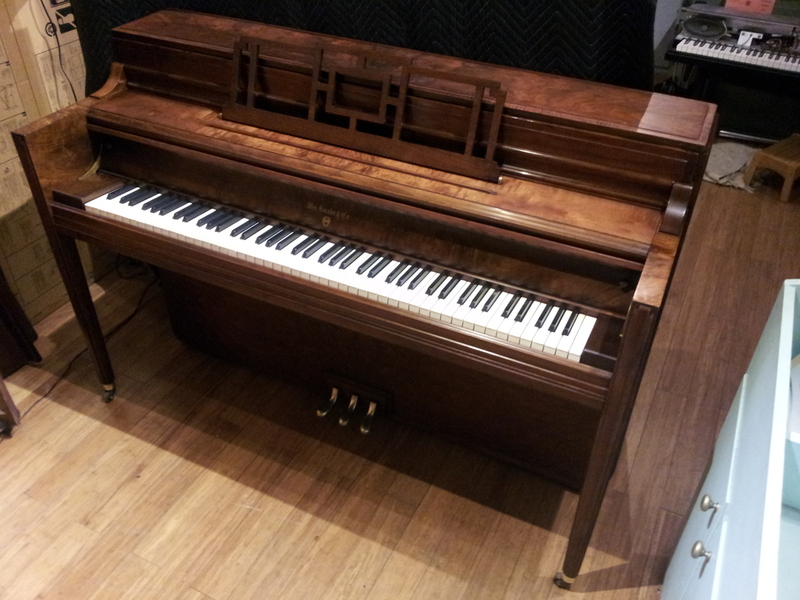 This is an amazing deal, a vintage walnut Steinway that dates to 1894(! ), complete with a shimmed soundboard, new strings, tuning pins, and complete new action. This piano has been refinished, and has a very regal look and sound to it. The ivory keys are original in excellent condition. 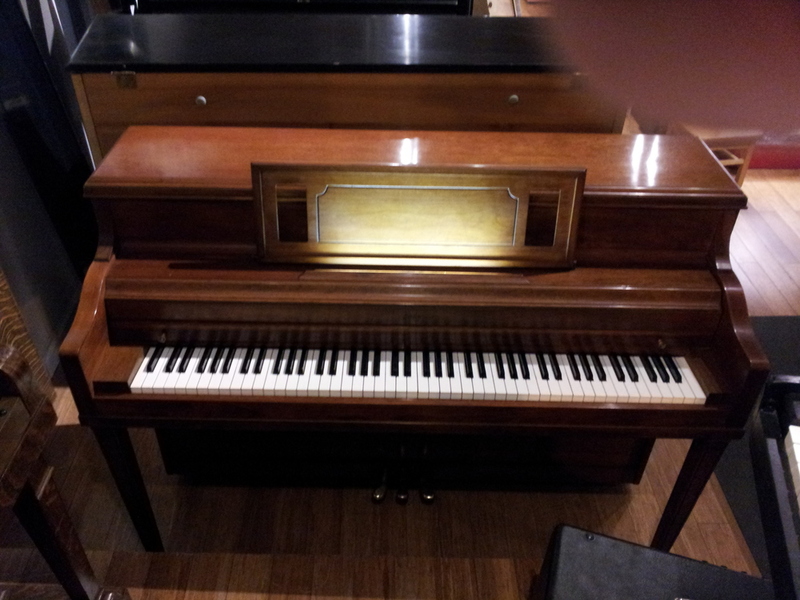 There is not a shop-rebuilt Steinway in this condition on the market for less! Price includes delivery, tuning and three year warranty. Sold. The Yamaha U1 is one of the most popular pianos throughout the world, and this walnut-cased piano is a great find, dating only to 2009, and including the Dampp-Chaser in-piano humidity control system. This is a piano made for the American market, not a gray market Yamaha that are very common here in New York City. Sale includes 3 year warranty, local NYC delivery and an in-home tuning to be used at anytime. SOLD. One of our favorites, this 1968 Kawai walnut console that looks and plays fabulously! This is a great deal on a quality Japanese make. Padded bench can be custom upholstered to any pattern. Includes local delivery, 2 year warranty and tuning. SOLD. Yamaha makes some of the most dependable and consistent pianos in the world. This great little M2 dates to 1967 and is in near mint condition. Perfect for either a first piano or a smaller piano for any experienced player, the action is crisp and the sound is clean. The middle pedal is attached to a muting rail, making it great for New York apartments. Included is local delivery, 2 year warranty and an in-home tuning. SOLD! 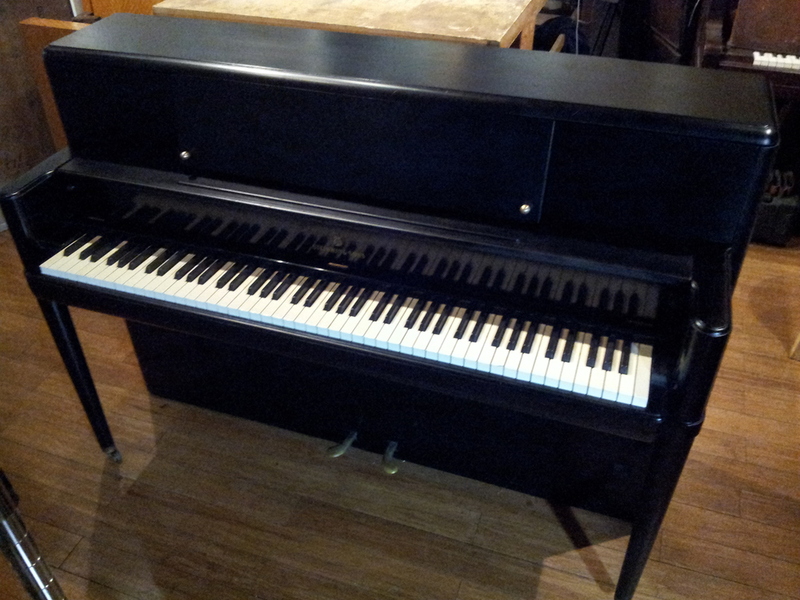 A stylish piano in medium gloss black, dating to 1963 and manufactured in Boston. 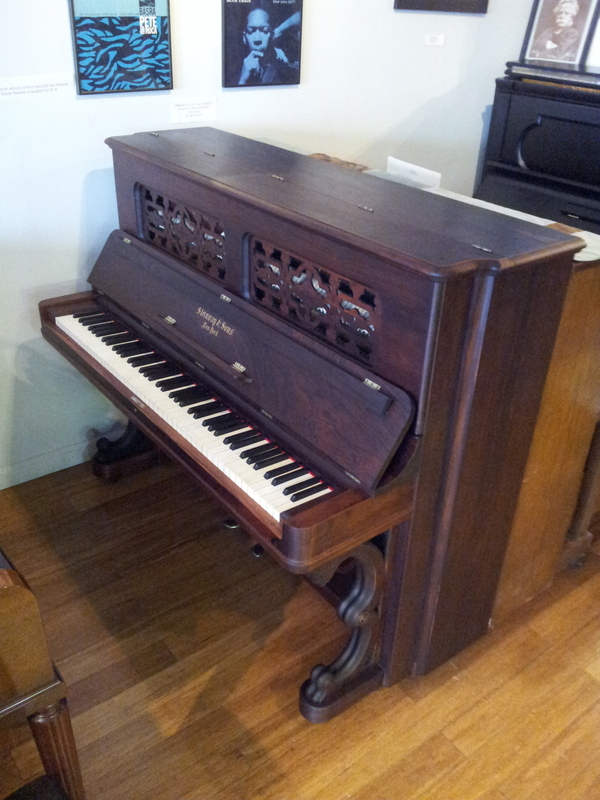 Refurbished action and regulated for a smooth, easy touch--a beautiful starter piano! Includes tuning, delivery and two year warranty. SOLD! This 1960 Kranich & Bach features a beautifully figured red mahogany case, refurbished action and matching bench. The Koranic & Bach piano company was originally established in 1864 in New York City, and is one of many quality-oriented American companies that existed until later in the 20th century. Sale includes delivery, tuning and two year warranty.